My name is Cryo & I tend to set lofty, difficult goals and go for them! I'm a laid back guy who just enjoys meeting & getting to know new people, travelling, seeing new places, & of course, playing vidya gaemz! I'm also someone who encourages people to open up and talk about any problems they may be having and try to help them through the tough times. I know what it's like and hate to see others go through it. Ever since I was little, I've always loved taking things apart to figure out how they work, playing games (video, board, card, I like em all), meeting new ppl, & travelling. I also love working with wood. Taking a pile of lumber and creating something beautiful out of it is unbelievably satisfying. I want to reach as many people as possible, learn about cultures different than my own, and continue to make a living doing what I love. RuneScape3 is my main game, but I also play other games on occasion. A few of the other games I've streamed includes Life is Strange, Minecraft, Portal (1 & 2), Borderlands 2, Qube, several horror games, several community games, others I can't remember atm, etc. The best "war story" I can remember would be the time I was in a stream that I moderate and someone threw one of those obnoxious spam bots into the chat that sends hundreds of accounts into the chat at once purely to spam and cause chaos. Between myself and a few other moderators that were there, we got the bot spammers banned within a minute or two with only one incorrect ban going to an actual viewer, but it was reversed immediately and made for an overall good story. I've also had a few instances where I'll notice a viewer put a very....odd comment into the chat that happens to look alot like a password or authentication code. I immediately purge them and make sure they change their details just incase. I moderate quite a few channels and am happy to do so because I understand how stressful it can be to a streamer to have people disrupting the chat and having to take time out of their stream to take care of it. It can detract from the viewer's enjoyment as well as the streamer's enjoyment & the flow of the stream in general. Plus, moderating is generally fairly easy to do since the vast majority of people are happy to follow channel rules & if they do step out of line, usually a quick reminder is enough to stop any bad behavior. I love seeing people accomplish their long-term goals. It's incredibly satisfying to see someone FINALLY achieve something they've been working toward for weeks, months, or even years. This list would be huge if I didn't limit myself so I'll stick to just 3 for now. Zant - He's a variety streamer, but mainly does Zelda: BotW speedruns. He's a super chill guy & is super fun to talk to. Laquetuph - Stardew Valley streamer. His chat is ridiculously relaxing to be a part of and he's always supportive of everyone in his chat. Report Cryo's profile for containing a lack of content. Report Cryo's profile for containing unsafe links. Report Cryo's profile for containing offensive content. Report Cryo's profile for containing formatting errors. Report Cryo's profile for containing invalid links. 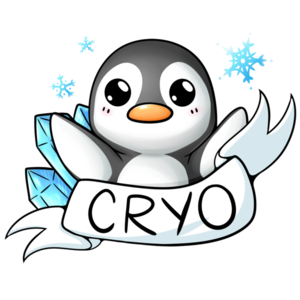 Report Cryo's profile for another issue.